Montrose, CA . 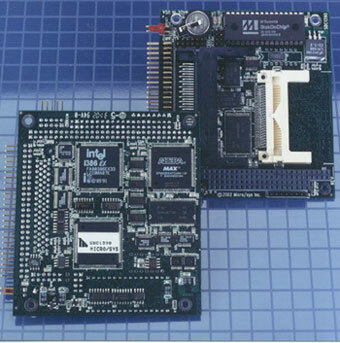 . . Based on a highly integrated 386 core, the SBC1390 from Micro/sys provides a powerful controller in a PC/104 (3.55" x 3.775") footprint that will communicate with other computers in a wireless network. In addition to PC-compatible features, such as four serial ports, three timer/counters, and two cascaded interrupt controllers, the new model can also include an on-board PC Card interface that accepts a Wi-Fi (IEEE 802.11b) wireless Ethernet card. By using wireless technology, the need for extensive field wiring is greatly reduced, which can lead to a lower system cost. No network cabling, switches, or hubs are needed. The SBC1390 with Wi-Fi will communicate wirelessly with multiple Wi-Fi clients or access points. The throughput of the wireless network is up to 11 Mbps, which is faster than a 10BASE-T wired network. Control, data acquisition, monitoring, point-of-sale, and many other applications can benefit from wireless networking. solutions. If needed, I/O expansion can be added to the SBC1390 through PC/104 cards. In its stackthrough version, the SBC1390 is ideal for plugging into a custom OEM I/O card. The CompactFlash connector on the SBC1390 can accept flash cards from 16 megabytes to one gigabyte in size. CompactFlash can be used as solid-state storage for operating systems and large applications. Micro/sys installs a ready-to-run firmware system on the SBC1390 at no cost. This firmware includes a complete industrial BIOS, board setup screens, application download utilities, and a DOS-compatible operating system that boots immediately upon powerup. Alternatively, the board may be configured to boot 32-bit operating systems. The basic SBC1390, with 16MB of DRAM and 1MB of flash, starts at $295 in single quantity. A free development kit is provided that includes cables, sample software, and full documentation. Options may be added, which include: a PC Card interface, a Wi-Fi PC card, CompactFlash, increased DRAM, and an enhanced accuracy real-time clock. An industrial version with ?40°C to +85°C operation is also available. Significant OEM discounts are available. Contact Technical Sales Dept., Micro/sys, Inc., 3730 Park Place, Montrose, CA, 91020, phone (818) 244-4600, FAX (818) 244-4246, info@embeddedsys.com, www.embeddedsys.com.